Reading this lovely children’s book, I was continually astonished that these were indeed original tales, rather than ancient folk tales. 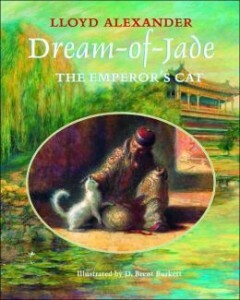 Lloyd Alexander, perhaps best known for his fantasy children’s books for older readers, has completely captured the genre of classical Chinese folk tales in an impeccable style. Along with the extraordinarily beautiful illustrations, it’s hard to think it was just written a few years ago. The book is a perfect read-aloud children’s book, with several separate chapters, each of which stands alone. Each is like a typical ancient fairy tale or fable. The wise cat consistently knows much more than the supposedly wise men of the kingdom, and each chapter presents a simple moral, easy to understand. The language in the book is more advanced than a 5-year-old might know, but that only adds to the beauty of the book. There’s lots of room for conversation about the meaning and language. If, in addition, the young child happens to love cats, then this children’s book is a definite winner! I can’t wait to read it to my 5-year-old grandson. I think once children hear the book read aloud, they will thoroughly enjoy going back to it when they can read on their own. I categorized this as historical fiction primarily because it gives a glimpse into the old Chinese empire; however, I don’t feel that is the essential purpose of the book, but simply the perfect setting for these little tales of wisdom. Hats off to the author for bridging time and space to bring us a classic.